What is the best way to see Northern Lights? We are sure that you heard about Northern lights before and probably saw photos of it, but what exactly is this phenomenon? In simple words it is a natural light, that can be seen in the sky, mostly in the high latitude, for example Iceland, Canada or Alaska. The view is so fascinating that many tourists will spend days to be able to see these moving green lights. Northern lights, which are also known as Aurora Borealis, is one of the most popular tourist attractions in Iceland, unfortunately it is difficult to predict this phenomenon. There are more chances to capture this fantastic moment, if you visit the country from September till mid April, as nights in this period are completely dark. It is also more likely to see Northern lights in small towns and far away places, which almost doesn’t have street lightening. To increase chances even more, it is better to stay somewhere in northern part of the country, as nights are longer there. One of the most popular locations to see Aurora Borealis is Landmannalaugar. This beautiful place in the Highlands of Iceland is famous for its stunning landscape, active volcano and geothermal hot springs. Due to its remote location, Landmannalaugar is a perfect spot to capture this outstanding phenomenon. Unfortunately even perfect location and timing won’t guarantee that you will be able to experience this breathtaking moment. There are several obstacles, that should be taken into consideration. First of all the weather: it is impossible to see Northern lights in cloudy or bad weather, as sky should be absolutely clear. There is a tendency that during the coldest days, sky is more clear, than in warm weather. To avoid disappointment, it is better to check weather before you are planning to capture Northern lights. 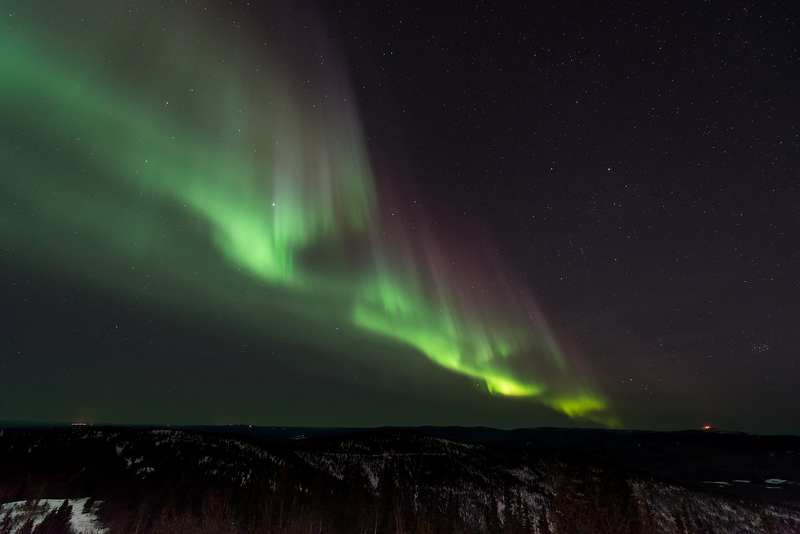 There are different forecast services, that can help you to increase your chances to see Aurora Borealis. For example, you can check Aurora forecast, white area in the map will show you the clarity of the sky. Also it is important to stay at least one weak to be able to chase this phenomenon. Usually Northern lights are active for two or three nights and then for next four days it is hard to see them. Even though it is hard to chase Aurora Borealis, but when at last you will enjoy the moment, it will become one of the most remarkable memories in your life, after all no photos can express the incredible beauty of this natural process.